Home Cleaning Toy Boxes vs. Cube Storage: Which is better for your kids? It is easier for a child to put all their toys into the same toy box because there’s only one place to put all those things and shut the box. Fewer spaces mean there’s less thought to figure out where to put things. The toys may not be put in there neatly, but they can be put there quickly, especially if you ask them to clean their rooms in ten minutes. With several toys in the same box, there is a likely chance that the weight of the toys might displace parts or crush toys underneath. Or pulling a doll from the jumble may lead to dislocating a doll limb that needs to be taken to the dolly hospital to get her fixed. By placing the toys in different spaces, the weight will not accumulate in a single bin, at least not enough to break a toy. Toy Box is more compact and less bulky than a cube organizer. Some have handles, so a child is able to move a smaller toy box. A cube organizer is generally not moved and if one side of the cube organizer is unfinished, the exposed wood particles are unpleasant to touch. Cube storage can have bins for every hole that can be labeled to categorize items go in them. But even if a child is just likely to place items in any bin, they are more likely to at least put playsets or similar figures or toys together so those things can be located and played without rummaging through a pile in the toy box. 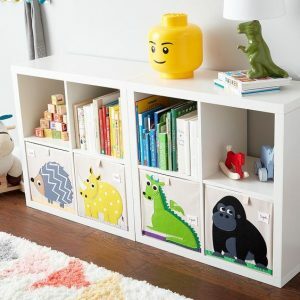 The best cubbyholes can hold many things but the largest cube size tends to be 13” x 13.” The toy box has the benefit of being a large, single area of storage. Granted, if you put a lot of large stuffed toys in it, you’ll still run out of room quickly. Electronics these days are hardier but there’s still a chance that it can be sensitive to any banging to the side of a box. The bins of a cube have the advantage of having a separate area or wires, batteries and chargers or keeping the appropriate power cords with each item. If there is any small accessory you need to keep with your smaller device, bins are a much better choice. 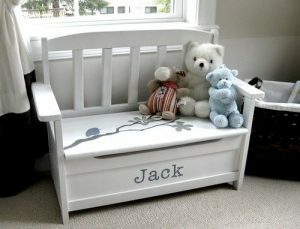 While both pieces of furniture can be tailored to a child’s taste, there are enough surfaces of a toy box to paint it, add stickers of a child’s favorite character on it and even put their name on it. The bins can be changed in color or texture, but it does not have the same visual impact or feeling for a child who will feel that a toy box is personalized for them. While it seems more likely for the toy box to have the advantage, there is a distinct disadvantage of piling the board games in a single pile; if you want to get the board games at the bottom of the stack, you have to potentially pull out all of the boxes just to get to it. 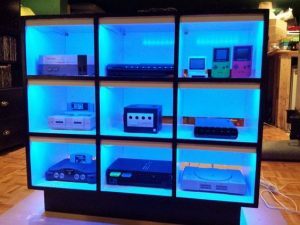 This might be a storage solution if you need just a place to hide them, but the inconvenience will constantly discourage someone from accessing these board games. The Toy Box is an easy solution, like a much nicer version of a storage bin. 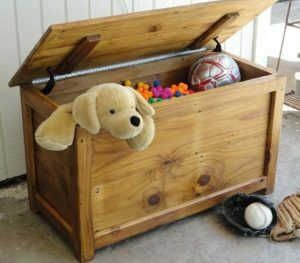 If a toy box remains with a kid for a long time, then it becomes a nostalgic piece of furniture, thus adding sentimental value. A cube storage organizer generally does not carry that history. In fact, when people move from place to place, people are more likely to buy a new cube organizer and rebuild it because they are perceived to be cost-efficient enough to purchase a new one. They both start around the same price of about $40.00. As they get higher in quality, the toy box is more likely to be expensive, but since we’re looking more at cost-efficiency rather than scaling in quality, this is tied. Final result: Toy Box comes out with the advantage, just narrowly beating cube storage as a better solution. The toy box is the time-tested and more traditional storage furnishing for your kids; kids may take ownership of a toy box as much as their toys if they know that the toy box belongs to them. Asking kids to clean their room is as simple as throwing everything into the same box and kids will never need to guess where many of their toys are. A cube organizer might be a better solution for older kids, especially if they play with more electronics and are constantly looking for batteries and cords to power up their handheld devices. Do you have ideas for furniture that you would like us to contrast and compare? Are there points that we may have missed in their comparison that were important to you? Let us know in the comments on the next comparative review that you would like to see next!